The XLP 50x Label Printer series is the perfect print solution for medium label volume applications, available in 4 and 6 inch print width. It can be used with thermal transfer or thermal direct technology and prints high quality barcodes, fonts, and images on a large variety of label materials: (coated) papers, PE/PP or cardboard up to 152 mm width. To meet the tough demands of industrial applications, the high-performance, durable tabletop printers of the 64-series are most ideal. With a print speed of up to 400 mm/sec, the 64-series printers operate faster than any other printer in the marketplace and therefore become the best choice for increasing productivity and reducing expensive operator time for printing labels. Our 64-series printers are dedicated to printing barcodes, fonts and logos on any label material in excellent quality. Unique standard features, such as ribbon save, 600 meter ribbon rolls, print width up to 203 mm (8 inch) and print speed up to 400 mm/sec deliver immediate cost saving without compromising on print quality. The standard data interfaces like Ethernet and USB enable easy integration into existing processes and internal networks in any industry and location. The 64-series family includes four models with different print width (in inches): 64-04, 64-05, 64-06 and 64-08. Combining the 64-0x models with our smooth LTSI applicator transforms the printers into flexible, semi-automatic Print & Apply Solutions. Having the same printer specifications as our range of Print & Apply models ALX 73x and ALX 92x, the 64-series printers are the perfect fit to complete your total printing and labeling processes. To support the growing demand for RFID label applications, our 64-series tabletop printers can optionally be equipped with RFID-UHF readers. Besides performing standard printing jobs the 64-series is able to code, write and verify RFID-UHF labels and tags. 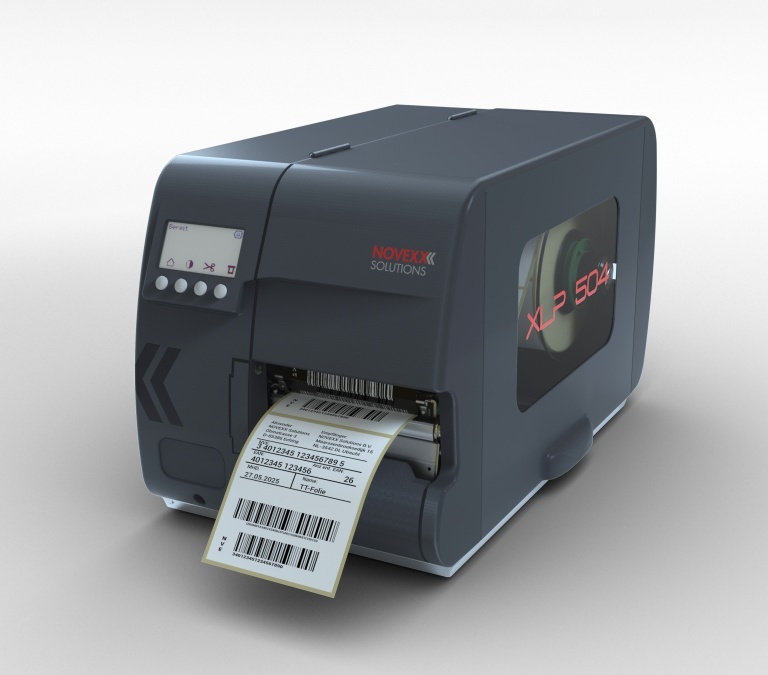 The XTP 804 is designed for high quality printing of single tags, tickets and blister cards based on the NOVEXX Solutions 64-series print module. Equipped with a high performance thermal direct/thermal transfer printer with 4’’ print width the XTP 804 is the perfect solution to meet today’s high standards of product identification with single tags.